Klasmann-Deilmann is a manu­fac­tu­rer of gro­wing media. “What is that, actual­ly?” is a ques­ti­on that is pres­um­a­b­ly not only asked by youngs­ters in the eighth gra­de who are begin­ning to think about a care­er. Pupils from Geschwis­ter Scholl School in Gees­te found out the ans­wer when they joi­ned us for a day of care­er gui­d­ance. The youngs­ters are gathe­red around a table whe­re they are using their hands to shape gro­wing media into balls the size of golf balls. Using their litt­le fin­gers, they make a hole in the ball into which they put flower seeds. With a few deft move­ments, they clo­se the hole again – and that’s all it takes to pro­du­ce a seed ball of gro­wing media and flower seeds. As the name says, gro­wing media are used for gro­wing plants. The Ger­man term – “Kul­tur­sub­stra­te” – is made up of the words cul­tu­re (as in hor­ti­cul­tu­re) and sub­stra­te, the sur­face or mate­ri­al on which an orga­nism such as a plant can grow. The term gro­wing media usual­ly refers to pro­duc­ts for the pro­fes­sio­nal hor­ti­cul­tu­re sec­tor, while most ama­teur gar­de­ners use the term “pot­ting com­post”. Gro­wing media and pot­ting com­posts are made from a varie­ty of raw mate­ri­als, which inclu­de peat, green com­post, wood fibres, coco fibres, fresh clay, sand, lime and fer­ti­li­sers to ensu­re a sup­ply of nut­ri­ents. As dif­fe­rent types of plants have dif­fe­rent requi­re­ments, the­re is a wide selec­tion of gro­wing media. But what does the job of tho­se peop­le who pro­du­ce and sell gro­wing media actual­ly invol­ve? The Prac­ti­cal Care­er Gui­d­ance pro­gram­me is inten­ded to deli­ver ans­wers to ques­ti­ons like the­se. It was orga­nis­ed by BNW, an edu­ca­tio­nal insti­tu­te run by various employ­ers’ and busi­ness fede­ra­ti­ons in Lower Sax­o­ny, in coope­ra­ti­on with the care­er gui­d­ance depart­ment of the Federal Employ­ment Agen­cy. The pro­gram­me is inten­ded to pre­pa­re youngs­ters atten­ding the lower gra­des of secon­da­ry school to deci­de whe­ther they wish to focus on sub­jec­ts that will lead to a care­er in a tech­ni­cal occupa­ti­on, in the health or soci­al sec­tor or in busi­ness. As a manu­fac­tu­rer of gro­wing media for the hor­ti­cul­tu­ral busi­ness, we are allo­ca­ted to the tech­ni­cal care­ers sec­tor. Making seed balls gave the pupils an initi­al prac­ti­cal idea of the impor­t­an­ce of gro­wing media and led them to con­si­der a num­ber of dif­fe­rent jobs and occupa­ti­ons. Hor­ti­cul­tu­ral engi­neers who have a Bachelor’s or Master’s degree are respon­si­ble for the qua­li­ty of our raw mate­ri­als, they deve­lop the sub­stra­te reci­pes and advi­se our custo­mers. Befo­re pro­duc­tion can begin, hea­vy-duty equip­ment, such as cater­pil­lar-track vehi­cles, is used to extract the raw mate­ri­als. At the com­pa­ny sites, wheel loa­ders are used to trans­port the raw mate­ri­als to the pro­duc­tion lines. This is whe­re con­struc­tion equip­ment ope­ra­tors are employ­ed. Elec­tro­nics engi­neers and indus­tri­al mecha­nics are also nee­ded, e.g. for main­ten­an­ce of this hea­vy-duty equip­ment and the machi­nes in our fac­to­ries. 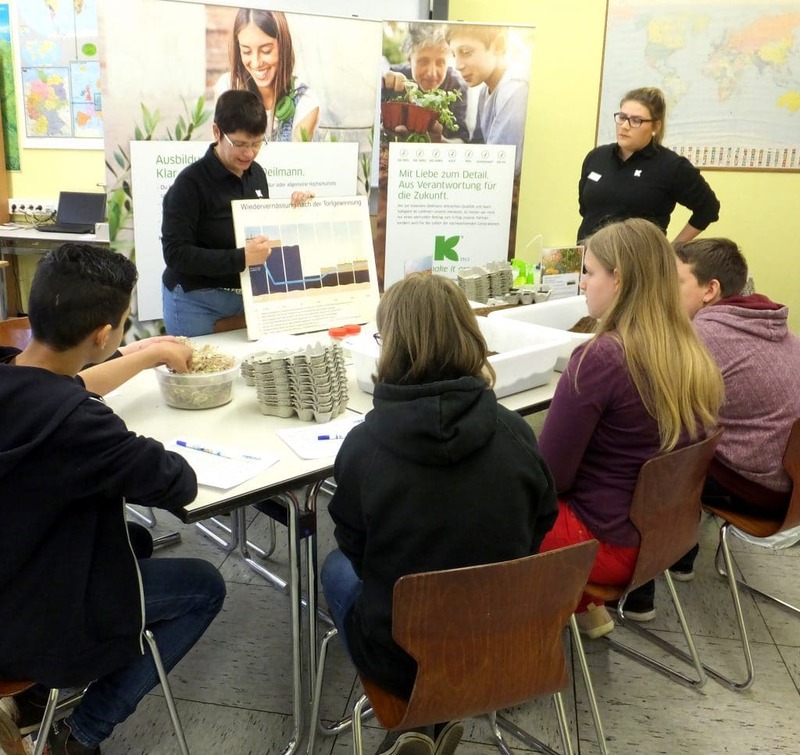 Bio­lo­gi­cal and agri­cul­tu­ral lab assi­stants work in our labo­ra­to­ries and inspect every pro­duc­tion batch befo­re it lea­ves the pre­mi­ses to ensu­re that the pH value and the fer­ti­li­ser con­tent are cor­rect. Indus­tri­al busi­ness admi­nis­tra­tors work in our sales depart­ment whe­re they pro­cess the orders acqui­red by our local sales com­pa­nies from their custo­mers. Busi­ness con­sul­tants with a hor­ti­cul­tu­ral back­ground are employ­ed all over the world. They regu­lar­ly visit our custo­mers to pro­vi­de them with prac­ti­cal help and assi­s­tan­ce. The employees in our logistics depart­ments are qua­li­fied for­war­ding agents who make sure that our pro­duc­ts reach the custo­mer on time. They plan the trans­port by rail, truck or con­tai­ner ves­sel. Work pla­ce­ments are an excel­lent way to find out what occupa­ti­on real­ly suits them. They give pupils the oppor­tu­ni­ty to get to know and try out the work that is typi­cal­ly invol­ved in the occupa­ti­on con­cer­ned. School gra­des: The gra­de awar­ded for effort and soci­al beha­viour is at least as important as the sub­ject gra­des. If the gra­de here is “cor­re­sponds to our expec­ta­ti­ons in full” or even “deser­ves spe­cial reco­gni­ti­on”, this is more important from the HR manager’s point of view than an excel­lent gra­de in mathe­ma­tics.